On the streets, under the arcades, in the museums. Terra Madre Salone del Gusto spreads around the city. 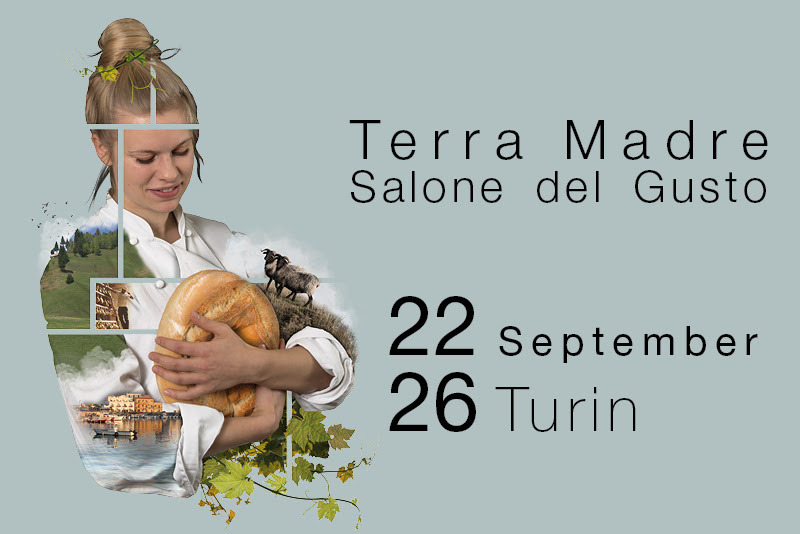 The program of Terra Madre Salone del Gusto, to be held from September 22 to 26 in Turin (Italy), is being enriched daily with new initiatives, which will invade the streets, squares and museums of the city, bringing together residents, tourists, Slow Food activists and delegates from 160 countries around the world. Via Po, with its arcades and old historic cafes, will turn into the Via del Gelato (Ice Cream Street) hosting tastings, meetings with producers, show-cookings and a large laboratory – inside Alberto Marchetti’s ice cream shop – where workshops, guided visits and conferences will be held. The Compagnia Gelatieri, a project of Alberto Marchetti, Andrea Soban and Paolo Brunelli, will bring together more than twenty artisans from all over Italy – the custodians of the very best traditional Italian ice cream – who will present the biodiversity of ice cream. First we’ll discover the cultivars of the ingredients, because each variety has a particular flavor and fragrance. Visitors will taste ice creams made with different varieties of the same product, for example Amalfi lemons and Syracuse lemons, Tonda Gentile Piedmont hazelnuts IGP and the Roman Giffoni hazelnut IGP. We’ll also focus on the search for particular raw materials, including a selection of flavors made with Slow Food Presidia products: Chontalpa cacao, Bronte pistachio, Bronda Valley ramassin, Tortona strawberry, Roccaverano robiola, Farina bóna and many others. Among the guests of Compagnia Gelatieri at Terra Madre Salone del Gusto, there will be gelatieri Zoldani (famous ice cream makers in the Zoldo valley, Belluno) who will produce Zoldan cream live before our eyes, using hand-held machines and methods of the nineteenth century, cooled with ice and salt. To find the complete list of exhibitors present in the Via del Gelato click here. Part of the proceeds from the sale of the ice cream will be donated to the Slow Food Foundation for Biodiversity. In the Via del Gelato there will also be an area dedicated to the tasting of Slow Food Presidia coffees. At the Castello di Rivoli, seat of the Museum of Contemporary Art, Amar Kanwar, Indian artist and filmmaker from New Delhi, will present along with Carolyn Christov-Bakargiev, director of the GAM (Gallery of Modern and Contemporary Art) in Turin and of the Castello di Rivoli, The Scene of Crime, part of his multimedia project The Sovereign Forest, which documents the impact of land grabbing in the Indian state of Odisha. The film tells of places, once belonged to the farmers and destined for the cultivation of indigenous rice, now the subject of interest from major multinational companies, and documents the social conflict between those who want to maintain biodiversity and those who promote GMO crops. During the evening, Christov-Bagarkiev and Kanwar will be joined by a chef well known for his ability to create a direct relationship between food and art, Davide Scabin of Combal.Zero in Rivoli. As well as talking about the importance of safeguarding environmental biodiversity, Scabin will also be serving two dishes made using ancient rice varieties. As well as presenting The Scene of Crime at Terra Madre Salone del Gusto, Christov-Bagarkiev and Kanwar will also be participating in the conference Our Relationship with the Earth Through Contemporary Art, showing how art can convey a message of responsibility and exploring its potential for representing the geopolitical transformations that affect the environment and the landscape. In the courtyard of the Egyptian Museum there will be a photo exhibition dedicated to the immense gastronomic heritage of ancient and contemporary Egypt. The exhibition, From Sinai Wormwood to Meraharah Bread: The Ark of Taste in Egypt, is a collection of photographs taken by Ahmed Elabd, a photographer from Ma7sool Production, a small company started by a group of young Egyptians that uses various media to document food production and agricultural and artisanal traditions in their country. An anthropologist, a journalist, a cheesemaker, a bread baker and an agronomist also contributed to the project, uniting their strengths and skills to select and photograph the foods that showcase the richness of Egyptian biodiversity, reflected in the many products nominated by Slow Food Cairo that have already boarded the Ark of Taste. As part of the collaboration between the Egyptian Museum and Slow Food, a conference will be held at Carignano Theater, on September 26, Food and Agriculture in Egypt, Yesterday and Today, which will see the participation of the director of the Egyptian Museum Christian Greco and the Egyptian sociologist Malak Rouchdy.